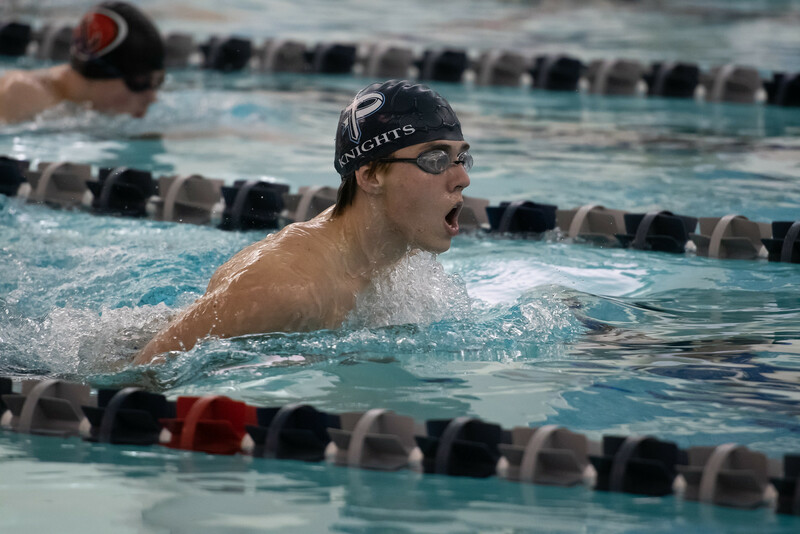 The AquaKnights dominated against Atlanta International School in last week's home meet, with seven new state-championship qualifying times and over 50 personal-best performances. The individual state-championship cuts came from senior Charlie Kaye, with wins in both the 200 IM and 100 breaststroke. Junior Erin Hood took first place in the 100 butterfly and 100 backstroke, and junior Jason Rosenbloum made his first individual state time with a win in the 100 butterfly. Rosenbloum also took the win in the 200 free. The boys 200 free relay team of Kaye, Rosenbloum, sophomore Henry Berman and senior Carter Fooman hit its state-qualifying time with a first-place finish in which Kaye lowered his 50 free state-qualifying time in the lead-off leg. Additional top swims included first-place finishes for the girls 200 medley relay team of Hood, sophomore Lizzy Kaye, and seniors Luisa Whitney and Sophia Lochan. Whitney took the win in the 100 breaststroke. Frooman and sophomore Maggie Jenkins both finished first in their respective 50 free races. Junior Meghan McMillin won the 100 free, while sophomore Lily Koch won the 500 free. Both the boys 400 free relay team of Charlie Kaye, Rosenbloum, Berman and junior John O'Brien and the girls 400 free relay team of Kaye, Hood, McMillin and Whitney finished the meet on top, with one of the most exciting swims of the night in the boys relay's final leg. Kaye entered the water almost a full pool length behind AIS and closed the gap with each lap to win, leaving the AIS relay in disbelief. Junior Will Stratton took first in diving for the boys, and Lizzy Kaye took the win for the girls, turning in a state-championship qualifying round. Jenkins followed in third, and freshman Kate Grabowski finished fourth. In his Pace diving debut, senior Tase Karamanolis came in second, followed by seniors Max Appel and Cooper Selig in third and fourth, respectively. The AquaKnights swim next on Wednesday, Dec. 5, at home against Pope High School at 5 p.m. The Knights started December with a bang – winning the first two region games against Towers and Redan, then avenging last year's close loss to 4A perennial powerhouse St. Pius with a convincing 53-23 victory over the Golden Lions. The Knights opened the St. Pius game with incredible defense, holding the Golden Lions to 4 points in the first quarter. 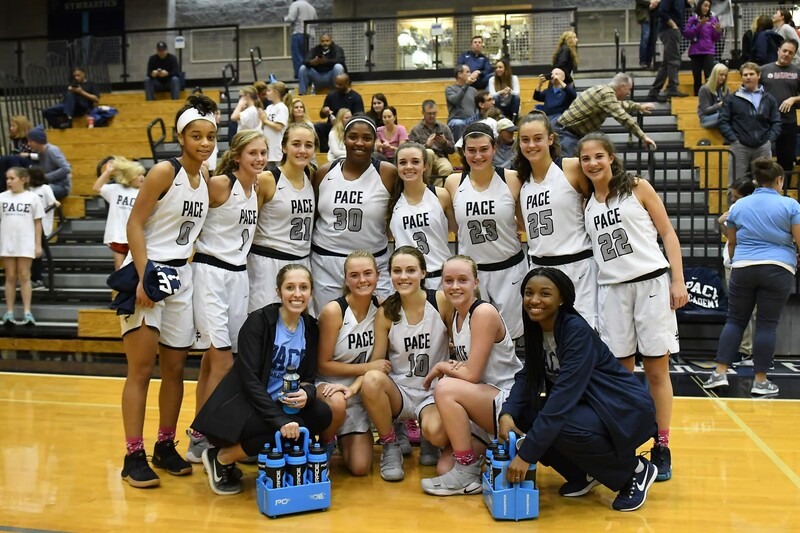 Despite being outsized, Pace's front-court duo, junior Virginia Hobbs and senior Kayla Ross, snagged 11 defensive rebounds and held St. Pius' post players in check with pesky post defense. Hobbs and senior Joelle Zelony stood strong, taking four charges in the first half, securing possessions that also put key St. Pius players in foul trouble. Offensively, Zelony led all scorers with 17 points and 5 assists, and senior Ann Rafeedie finished with 12 points and 7 assists. Ross finished with 8 points, 8 rebounds, while Hobbs, senior Madeline Janki and freshman Margo Kaye chipped in four points each. Senior Paige Fleming and junior Jordan Upchurch also added to the point total from the free throw line. On Tuesday, Dec. 4th, the Knights continued their winning streak defeating Landmark Christian 43-29. 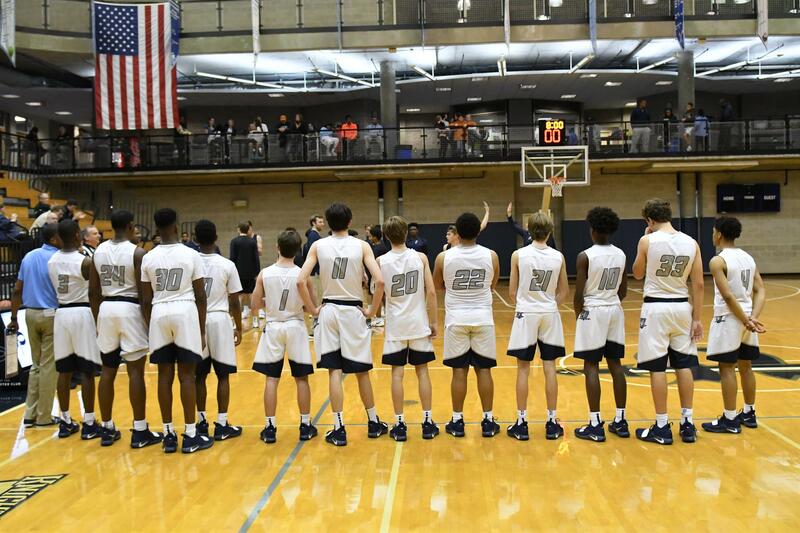 Our Knights need your support this Friday, Dec. 7, as they match up against a formidable region opponent, Cedar Grove, at 5:30 p.m. in the Inman Center. The team has worked hard, and it would mean a lot to them to see you in the stands cheering them on. The varsity boys basketball team had a jammed-packed week, facing off against two region teams and 4A state runner-up St. Pius. The Knights squared off against Towers Tuesday, Nov. 27, and emerged victorious with a score of 67-46. The Knights were led by sophomore Cole Middleton, who finished with 15 points, 10 rebounds and 2 steals. The Knights' lone senior, Myles Todd, also helped the cause with 14 points, and junior Reign Watkins provided 8 points. The key factor of the game was 28 points scored off Towers' turnovers. On Friday, Nov. 30, the Knights traveled to Redan High School to face the Raiders and unfortunately lost by a score of 55-50. "That was far from our best basketball tonight", said Coach Sharman White. The Knights were led by Middleton, who contributed 15 points, 12 rebounds and 3 blocks. Watkins contributed to the Knights' assist effort, dishing out 3 assists, and sophomore Madison Durr had a solid night from the field, going 3-7 and finishing with 6 points. The Knights put an emphasis on rebounding in this game, grabbing 40 total rebounds for the night. On Saturday, the Knights kicked off December with a strong fight to the finish against an experienced St. Pius team. The game went down to the wire, with St. Pius scoring a 3-pointer with 14 seconds left to take a 1-point lead that held for the final seconds of the game. St. Pius won 59-58. The Knights were led by Middleton, who contributed 18 points and 6 rebounds, Todd who scored 14 points, and sophomore Josh Mininberg who tallied 8 points. The Knights had a strong night under the basket, grabbing a total of 34 rebounds for the game and going 34 percent from both the field and the 3-point mark. The Knights rebounded from those losses on Tuesday, Dec. 4th defeating Holy Innocents 74-42. On Friday, Dec. 7, the team will match up against last year's region champion, Cedar Grove, at 7 p.m. at home in the Inman Center. Please pack the gym to support the Knights. 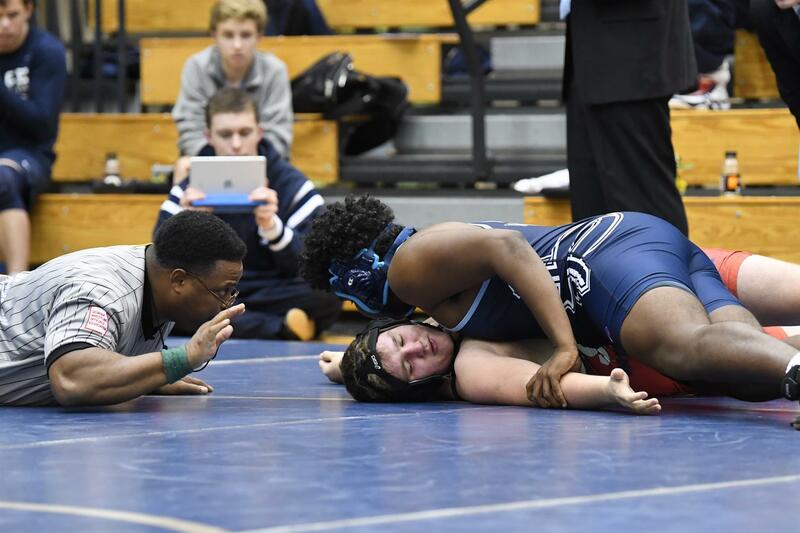 On Saturday, Dec. 1, the varsity wrestlers competed at the Westminster Duals. The team was missing a few members due to illness and injury, but still had a successful day. The Knights lost a close one to the host team (33-40). Pace also lost to Perry (30-51) and Marist (30-45) and beat Riverwood (45-36) and St. Pius (42-36). The freshmen lightweights led the way, as Ben Schiffer and George Blaha were 5-0, trading places at 106 pounds and 113 pounds throughout the day. Blaha had a particularly good 4-3 win against a tough Marist opponent who had beaten him previously. Sam Howe was 2-2 at 120 pounds; Jude Black was 3-2 at 132 pounds; and Alex Mathias was 3-2 wrestling at both 160 pounds and 170 pounds. Against his opponent from Riverwood, Mathias was tied with 10 seconds left in the match before he scored the final takedown to win. Senior captains Ahsan Hennings at 220 pounds and Charlie Warren at both 160 pounds and 170 pounds each wrestled well for the Knights. Hennings was 3-2, and Warren was 5-0 and is currently 20-1. This Friday, Dec. 7, the Knights will participate in the first-ever "Battle for the Buckhead Belt." The team will wrestle against Holy Innocents', Lovett and Westminster for the title of neighborhood champion. The matches will take place at Holy Innocents', and the first match is scheduled to start at 5:30 p.m. Come out and support the Knights as they take on our neighborhood rivals! Sign up for a volunteer shift during girls or boys varsity basketball home games. It is a super way to meet and interact with others in the Pace community, show your support for Pace Athletics and fill a very important need. Sign up by logging into myPACE and selecting BOOSTER CLUB under the PARENT VOLUNTEER section.